"Brides with a lot of confidence and full of personality wear red wedding dresses." "Definitely an attention grabbing color! " Color psychology simply put, it is a study of how color affects our mood, emotions and behavior. What about the color red? The color red is connected with assertiveness, spontaneity, enthusiasm and courage. But it also can be connected with recklessness, aggression, anger and impatience. All colors carry both a positive and a negative connotation. Red also represents energy and growth. Different cultures look at the color differently. In China and among some other Asian countries red is a traditional bridal color. It is thought of as bringing good luck, happiness, joy and celebration. Also, red has been said to be the "I want to be me color." 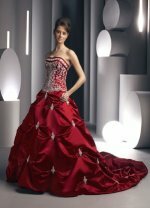 So if you are a bride who wants to be unique and step out of the box.... then a red wedding gown dress my be for you! "Just make sure the color works with your hair and skin tones". Since there are different shades of red, some with blue undertones and others with yellow undertones, find the shade that compliments you the best. 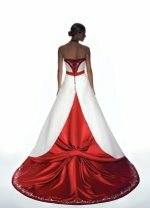 If a solid red dress is a little to daring for you then try a red and white wedding dress. A white wedding gown with red details can be quite striking. The red details can give a slimming appearence when placed in just the right places! 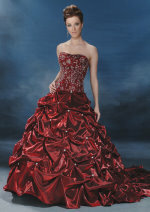 But if you are looking for that unique wedding dress with "wow factor" --- a red wedding dress certainly delivers!